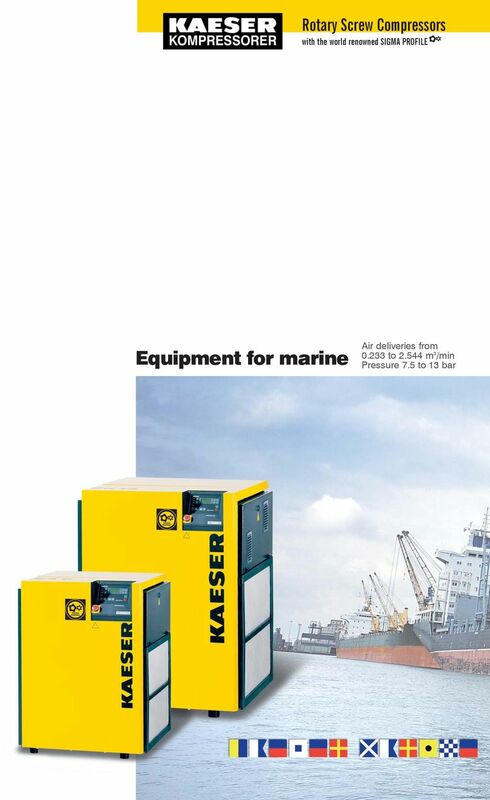 Download "Equipment for marine. 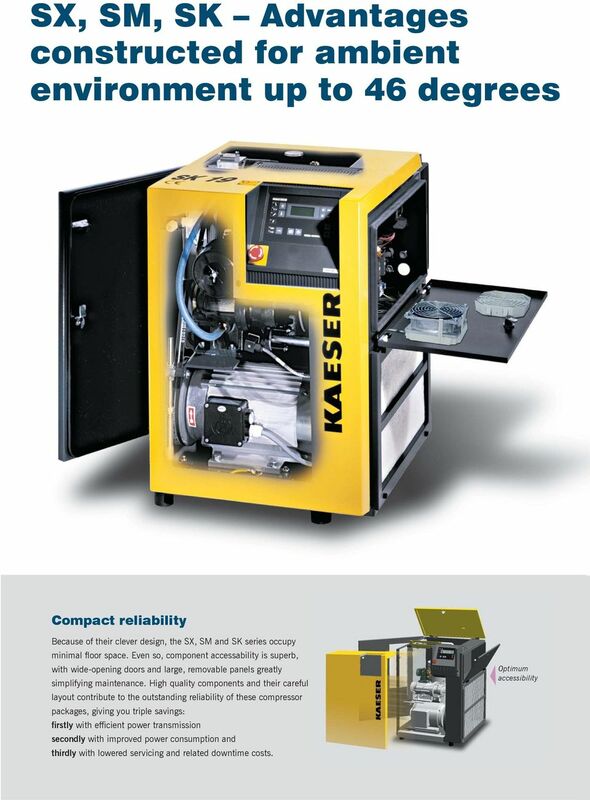 Rotary Screw Compressors with the world renowned SIGMA PROFILE"
4 Airend with SIGMA PROFILE The airend rotors feature the high-efficiency SIGMA PROFILE developed by KAESER. Accurate machining and heavy-duty precision bearings guarantee continuous performance and long life. Example 1: The most common component arrangement is compressor, air receiver, and desiccant dryer Power-saving electronic motor KAESER s high efficiency motors consume less power for more output. They are dust and splashproof to IP 54 and conform to insulation class F for more power reserve. Example 2: An arrangement used if demand fluctuates heavily is compressor, centrifugal separator, refrigeration dryer, and air receiver Automatic belt tensioning Correct belt tension is automatically assured, resulting in constant transmission efficiency, extended belt life and high reliability. Effective fluid separation The combination of centrifugal and gravitational initial separation with a special separator cartridge results in less than 2 mg of fluid remaining in each cubic metre of compressed air. Maintenance requirements are minimal. The easy-to-use control system SIGMA CONTROL is based on a robust, updateable industrial computer with a real time operating system. The operational state of the compressor is quickly ascertained with the help of traffic light coloured LEDs. A four-line, plain text display, easily understood icons and touch keys allow fast setting up and operation. 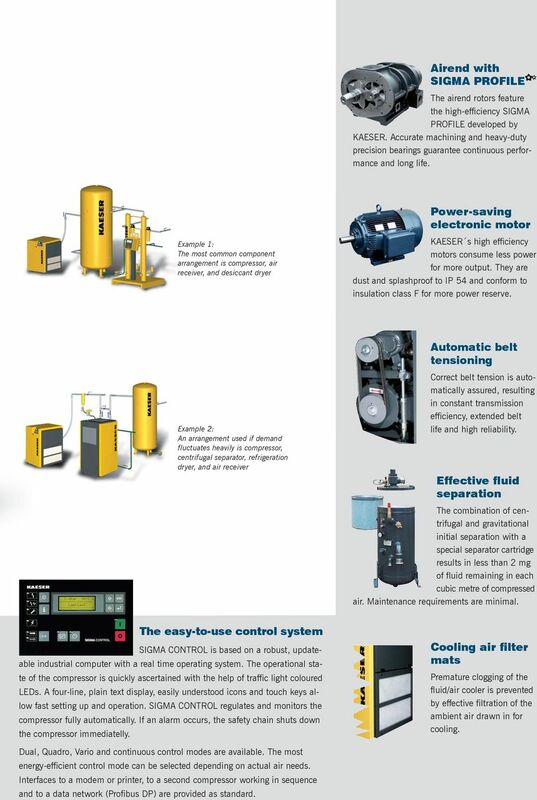 SIGMA CONTROL regulates and monitors the compressor fully automatically. If an alarm occurs, the safety chain shuts down the compressor immediatelly. Cooling air filter mats Premature clogging of the fluid/air cooler is prevented by effective filtration of the ambient air drawn in for cooling. Dual, Quadro, Vario and continuous control modes are available. The most energy-efficient control mode can be selected depending on actual air needs. Interfaces to a modem or printer, to a second compressor working in sequence and to a data network (Profibus DP) are provided as standard. 6 About us KAESER Kompressorer AS is a subsidiary of KAESER Kompressoren GmbH in Coburg. 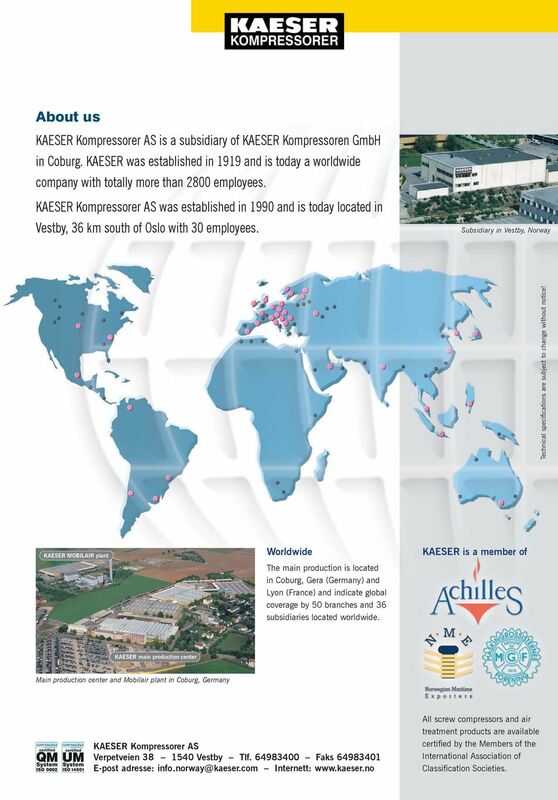 KAESER was established in 1919 and is today a worldwide company with totally more than 2800 employees. KAESER Kompressorer AS was established in 1990 and is today located in Vestby, 36 km south of Oslo with 30 employees. Subsidiary in Vestby, Norway Technical specifications are subject to change without notice! KAESER MOBILAIR plant Worldwide The main production is located in Coburg, Gera (Germany) and Lyon (France) and indicate global coverage by 50 branches and 36 subsidiaries located worldwide. KAESER is a member of KAESER main production center Main production center and Mobilair plant in Coburg, Germany KAESER Kompressorer AS Verpetveien Vestby Tlf Faks E-post adresse: Internett: All screw compressors and air treatment products are available certified by the Members of the International Association of Classification Societies. Rotary Screw Compressors SX Series With the world-renowned SIGMA PROFILE Free air delivery from 0.26 to 0.81 m³/min, Pressure 5. 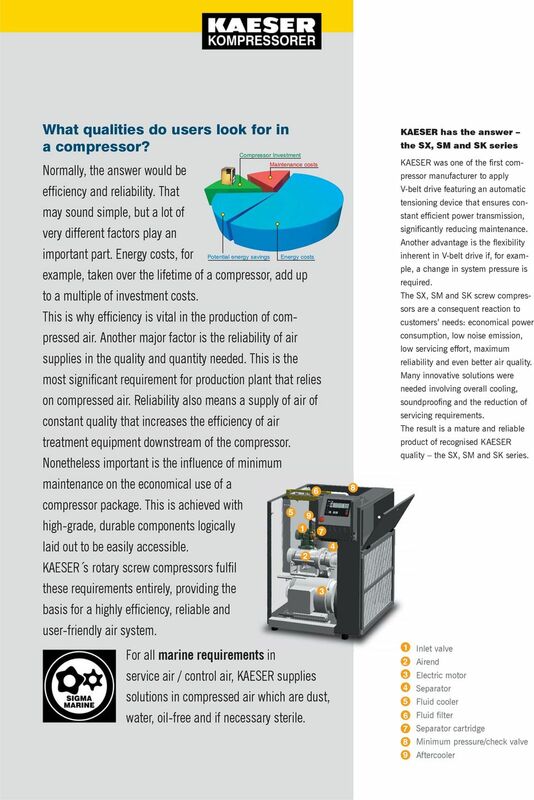 Rotary Screw Compressors SM Series With the world-renowned SIGMA PROFILE Free air delivery 0.28 to 1.52 m³/min, pressures 5.
www.hpccompressors.co.uk Rotary Screw Compressors ASD Series With the world-renowned SIGMA PROFILE FAD 2.09 to 5.51 m 3 /min, Pressure 5. Rotary Screw Compressors BSD Series With the world-renowned SIGMA PROFILE Free air delivery 1.12 to 8.19 m³/min, Pressure 5. RS 3.0 55.0 kw size: 3.0 55.0 kw RS-TOP 3,0 RS-TOP 15,0 RSK-TOP 3,0 RSK-TOP 15,0 RS 3,0 RS 55,0 RSK 3,0 RSK 45,0 The Company RENNER, a family company, are specialists in the manufacture of screw compressors. Rotary Screw Compressors CSD / CSDX Series With the world-renowned SIGMA PROFILE Flow rate from 1.05 to 16.95 m³/min, Pressure 5. When required, rugged & powerful but always dynamic & modern. 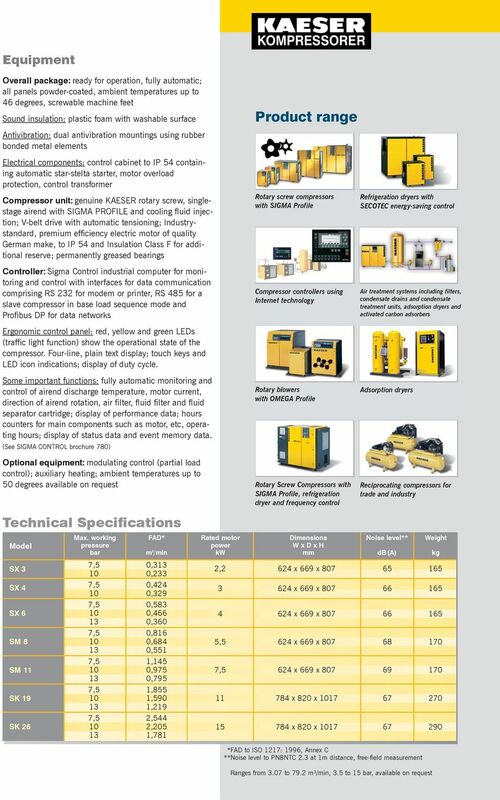 RENNER The expert in screw compressors RS-D and RSF-D series with direct drive Made in Germany rs All compresso h available wit ntrol! frequency co Motor size: 95 355 kw The company reliable and dynamic! LUBRICATED ROTARY SCREW AIR COMPRESSORS. 25 to 40 HP Sullair LS-10 Series Air Compressors. They re bulletproof. LUBRICATED ROTARY SCREW AIR COMPRESSORS 25 to 40 HP Sullair LS-10 Series Air Compressors. They re bulletproof. SULLAIR Unchallenged leadership For decades, Sullair has been a leader in rotary screw technology.